Our previous post on extraction (see here and here) looked at using biml (and biml script) to create a package driven by metadata which was defined in biml. We introduced the concepts of modularisation and showed how a group of biml files could be compiled sequentially to separate out the logic of solution components. Including asset definitions in biml sounds like a good idea, you can have objects defined as structures in code so the entire solution is defined and managed within a single set of project files. However, one issue with this approach (and the problem relates to the SSDT or BIDS representation of biml) is that that object definitions are only available for package generation and you can’t visualise and edit the table as you can in MIST (a biml tool from Varigence). As an alternative to this approach, we can define our ETL as content in a relational model. Then, we can use biml script to build a package based on that content. Note that we are not talking about a data driven modelling approach here. A data driven approach builds ETL and target schema based on the design of a source system. This approach simply uses database content to define how data is moved. The benefits are that there can be any number of interfaces to the model and packages are built with consistency in a very fast manner. We have already defined the target environment and now want some managed way of creating a package(s) to populate it. Now that we’ve got an idea about how to use iteration in C# code and embed that with biml, we can look at how to define the package that moves the data. 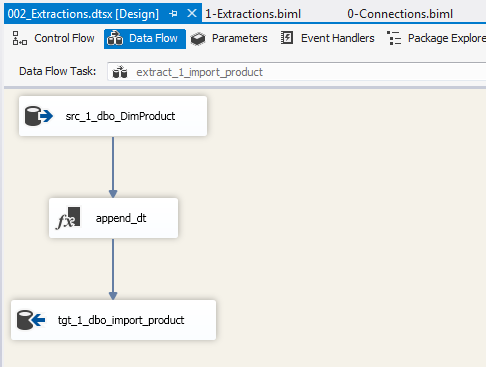 We’ll look at this as a twostep process, firstly, create the biml (and script) to iterate over each extraction (the output from the stored proc staging_extractions) and create a container with a truncate and empty data flow (as below). Then in the second step, we can populate the data flow with transforms. Our proc (staging_extractions) has a list of extraction objects. All we have to do is iterate over those and create the containers and their tasks. This is not dissimilar to the way that we created connections – its just that the biml contained in the foreach operator is a little longer. We used fully qualify names with the extraction_id in order to uniquely identity each task. I think there is also an interesting use of constraint declaration that’s worth discussion. Notice that the package definition defines parralell execution? This ensures that each container can execute in parrell. However for each container, I’ve specified its ConstraintMode as liner which means that tasks will have dependancies in the order that they are created. This is a neat trick so that we can enjoy the benefits of parralell execution for extractions but enforce a constraints within each extraction without an added burden of coding. Now that we’ve populated the control flow, we just need to populate the data flow with transformations (get source data, append the date, define the destination). This is shown in the image below. We will do this so we just add the tasks and look at the mapping later. All we have to do is replace the data flow task (above) with the following snippet. You’ll notice that all script uses data from the _extraction table. The framework just simply adds the datasource, then the derived column and destination with names (and tables) that relate to the (current) extraction row in iteration. Name="src_<#= _extraction["extraction_id"] + "_" + _extraction["entity_schema_source"] + "_" + _extraction["entity_definition_source"] #>"
Name="tgt_<#= _extraction["extraction_id"]+ "_" + _extraction["entity_schema_tgt"] + "_" + _extraction["entity_definition_tgt"] #>"
Now to turn our attention to column mapping in the destination. If we generate the package and look at the mappings for a task, you’ll note that the columns are not mapped. We can recall from our post on destinations (here) that we can specify source to target column with the following sample. Since we are already familiar with the idea of iteration, all we have to do is get a table of mappings for the current extraction and populate the column references. Remember that if we execute staging_column_mappings 1 (where 1 refers to the current extraction_id) we would get a set of results as below. Now, all we have to do is used script to add a columns tag to our OledbDestination. This can be done by adding the following snippet. For completeness, here is the entire file for package creation. <OleDbSource Name="src_<#= _extraction["extraction_id"] + "_" + _extraction["entity_schema_source"] + "_" + _extraction["entity_definition_source"] #>"
<OleDbDestination Name="tgt_<#= _extraction["extraction_id"]+ "_" + _extraction["entity_schema_tgt"] + "_" + _extraction["entity_definition_tgt"] #>"
The entire code may be a little much to take in all at once and you could suggest that such an approach is quiet easy to create by hand. True, for three ‘tasks’, dragging and dropping may be easier than setting up this solution. Remember though, that the goal of the post(s) is to build packages based on content. Adding tasks would be as simple as adding records to our extract table and creating additional mappings (although the mappings are only needed to the extent that columns must be mapped). Sorry. It seems impossible to post the BIML snippet part. Great series, thanks for the inspiration Paul! Great staff! I love using biml to automate SSIS packages. Paul, How do you create table for selected columns from source table? If I want to control over which columns to be selected in excel or metadata table. There are a couple of ways to do it. For me, the easiest method it to have an external database with meta data that people can interact with. This is very similar to the information_schema catalogs in SQL Server. Then i have a group of classes which interacts with the data base. You don’t really need those, I just find it a lot easier to separate the code from biml script.